My husband is an ordained pastor of two churches. He does qualify as a minister under the IRS rules. He is the only person who gets paid at both churches. Both churches have the typical board (secretary, treasurer, etc.) which are unpaid positions. My husband receives a set pay from each church per month. The pay from both churches doesn't even add up to a living wage and all of our housing expenses can be accounted for with the amount that he brings in. The money that I bring in from my job is used for all the extras over and above housing expenses. Both boards have designated his pay as a housing allowance. Since I work outside the home, is it okay for my husband's checks to be allotted as 100% housing allowance or is it supposed to be divided up as part salary and part housing allowance? I've done my own research on this, but I am still confused. Then I have the age-old question: If any portion of the income should be reported as "wages", should it be on a 1099 or a W-2? Regarding the percentage of a minister’s compensation that can be designated as a housing allowance...I have done my research too and as you have probably noticed...the “opinions” of so called "experts" are varied. I attended a tax conference a couple of years ago and the presenter, who was a CPA, stated that a housing allowance should not be over 50% of a minister’s compensation package. Since then I have researched everything I could find on housing allowances and could not find anything in the IRS code or previous cases that verified that statement. Later I wrote an article about this subject. I took all of the research I found and complied it together so you can come to your own conclusion: Designating All Salary as Housing! 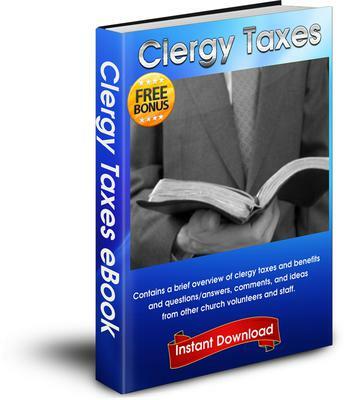 Regarding your question on a W-2 or 1099, pastors are usually considered employees of their churches and issued W-2s. Please consider purchasing the Church Accounting Package for more information on the subject of minister's taxes and housing allowances. My husband qualifies for housing allowance per IRS code. His employer has his separate housing paper work, however, did not include his housing allowance on his W-2. They stated that they didn't have to until next year. Please let me know if I need to request a corrected W-2 with housing allowance added to box 14. I thought that the housing allowance was nontaxable, however, when added to the Turbo Tax form, I lost over 2/3 of my refund. Is this correct? Your church is not required to report your housing allowance on your W-2. They can simply provide you with a letter stating how much was paid and for what period of time. A church should give a minister some kind of documentation of the housing allowance paid (whether on a W-2 or a letter) by Jan 31 of the following year. Additional information: Box 14 on a W-2 is simply an informational box that employers use to provide other information to their employees. However, as in the case of a housing allowance, some employers use Box 14 to report amounts that need to be entered somewhere else on your personal tax return. Regarding your second question: your tax program is probably correct. Although a housing allowance is exempt from income tax, it is not exempt from self employment tax (social security) unless you have an approved IRS Form 4361.